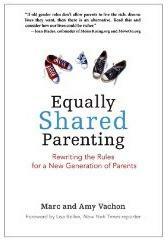 Marc and Amy Vachon are the founders of EquallySharedParenting.com, the first dedicated resource for egalitarian parenting from the perspective of both parents. Their work has been covered by the New York Times, USA Today, Boston Globe, Guardian (UK), Fitness magazine, The Today Show, Parenting magazine, Babble, Huffington Post and other media, and they are active speakers at professional work/life balance and family/marriage conferences. They have written their personal story of equally shared parenting in One Big Happy Family, an anthology by Rebecca Walker. Amy is a clinical pharmacist in a management role, and Marc is an information technology specialist. They live in Watertown, Massachusetts, with their two children, ages eight and five.